The best way to shop? With the seasons. So, every 2 weeks at Kitchen Stories, we'll be highlighting a different in-season ingredient along with 3 new recipes. To the market, we go! The giant, bittersweet citrus fruit pomelo is packed full of vitamin C to help strengthen the immune system—especially in useful in these colder months. The firm, juicy fruit is ideal for wintry salads, but also goes well with grilled dishes, sweet pastries and fragrant desserts. What's your favorite way to enjoy pomelo? Let us know in the comments below or share your best pomelo recipe with us at community@kitchenstories.com. 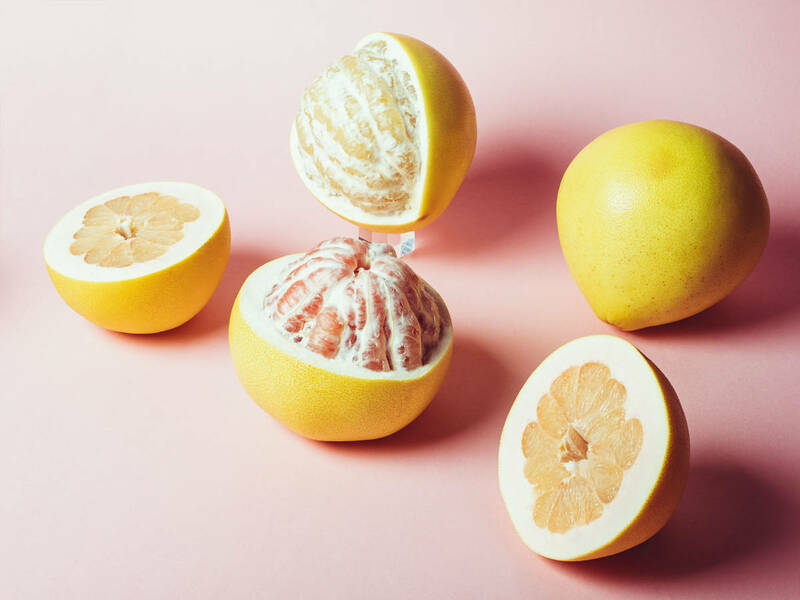 Though there is some confusion about pomelos and grapefruits, botanically, pomelos, which originate from South and South-East Asia are a species in their own right, while grapefruits are a natural cross between pomelos and oranges. A key difference is size with some specimens weighing in at about two kilograms and with a diameter of up to 30 centimeters! The large fruits have a round or slightly pear-like shape and, depending on the variety, a yellow or green skin, which is often finely dimpled. The flesh can vary in color: Especially popular is the Chinese honey pomelo, which tastes particularly sweet and the"Chandler", which is also sold as "red pomelo". Pomelos with light flesh often taste sweeter than the reddish variations, which have a sour and slightly bitter note. Like other citrus fruits, pomelos contain a lot of vitamin C. The low-calorie fruits also score points with plenty of fibre, potassium, and magnesium. Pomelos can not only strengthen the immune system, they also promote digestion and stimulate metabolism. Citrus fruits can also lower blood pressure through the bitter substance naringin. Pomelos are in season all year round, but at their best from roughly from December to February. They are often exported from China, Vietnam, Thailand, South Africa and Israel. In grocery stores you’l’ tend to find smaller and larger pomelos mostly shrink-wrapped in nets for transportation purposes. If the pomelo is quite heavy for its size, that’s a telltale sign it’s a juicy one. Pomelos are by nature not as juicy as oranges or grapefruits, but if the flesh is extremely dry, it’s a sign that the pomelo is too old. When you rub the skin at room temperature, the fruit should give off a lovely citrus fragrance. The skin does not have to be flawlessly smooth and in fact fruits with a slightly wrinkled, matt surface are often particularly ripe and sweet. At room temperature, the pomelo can be kept fresh for up to two weeks, and stored below 15°C/ 59°F even longer. To get to the fruit, you’ll first need to discard of rhe thick layer of pith between the skin and the flesh of the fruit. The best way to do this is to first cut off the top cap to see where the flesh begins. Then use a large knife to cut lengthwise into the skin and pith as if into segments then peel these sections off.Now you can divide the inside into segments, which are again enclosed with a thin, bitter skin which can be easily removed with your fingers or a small knife. Pomelos taste best raw, for example in Asian-inspired salads with zingy dressings. Pomelos also go well with grilled tofu, fish or halloumi. Chutneys, fruit spreads, desserts, drinks and sweet fruit salads also benefit from the slightly sour-bitter note of pomelo.